Ter nagedachtenis van Popski’s radio-operatoren. 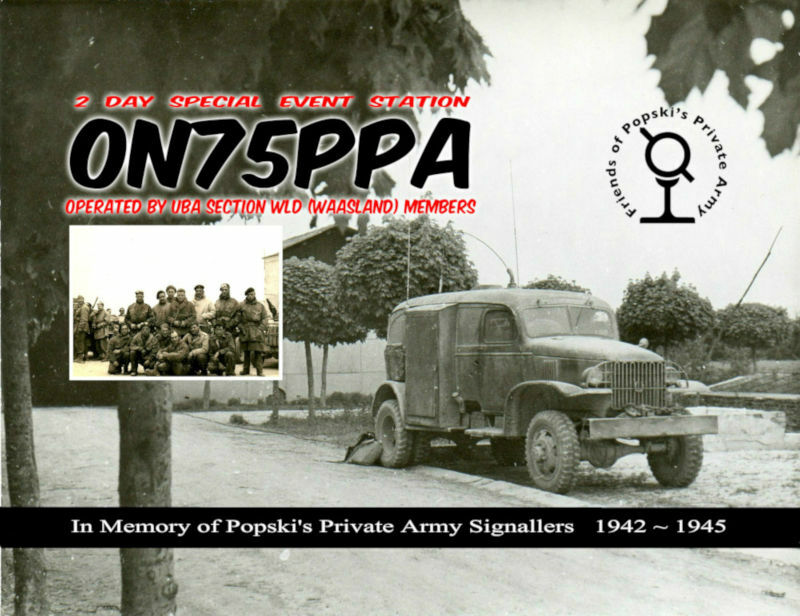 Dit is een speciale activatie van slechts 2 dagen op de Wings & Wheels-happening te Ursel, België, op 10 en 11 augustus 2019 door de UBA-WLD sectie ter herdenking van de radio-operatoren van Popski’s Private Army 1942 – 1945. Omdat 2019 het jaar is dat het 75 jaar geleden is dat Europa werd bevrijd, wou de UBA-WLD sectie even stilstaan ​​bij deze toch wel dappere radio-operatoren van deze nogal ongebruikelijke en onregelmatige eenheid onder leiding van de Belgische Vladimir Peniakoff aka Popski, een kleine Belg in een grote oorlog. Popski’s Private Army, officieel No. 1 Demolition Squadron P.P.A., was een eenheid met een Britse Special Forces set-up die in oktober 1942 in Caïro werd opgericht door majoor Vladimir Peniakoff oftewel ‘Popski’. Het privé leger van Popski was een van de vele aanvalseenheden die in de Westelijke Woestijn werden gevormd tijdens de Tweede Wereldoorlog. Het squadron diende ook in Italië en Oostenrijk en werd in september 1945 ontbonden. No. 1 Demolition Squadron P.P.A. werd speciaal gevormd om de brandstofvoorraden van veldmaarschalk Rommel aan te vallen, luchthavens aan te vallen en ontsnappingsroutes voor krijgsgevangenen te organiseren ter ondersteuning van het offensief van generaal Montgomery in El Alamein, op suggestie van luitenant-kolonel John Hackett. De eenheid werd operationeel op 10 december 1942 als een Special Forces eenheid van het 8ste Leger. Na de Long Range Desert Group (LRDG) en de Special Air Service (SAS) was PPA de laatste en kleinste van de drie belangrijkste onregelmatige aanvals-, verkennings- en inlichtingeneenheid die tijdens de Noord-Afrikaanse campagne werden gevormd. De radio-operatoren van P.P.A. stuurden berichten van ver achter de vijandelijke linies met hun Wireless Set 19 naar het hoofdkwartier van het Britse 8ste leger. Ook in de buurt van de frontlijn gaven ze berichten door aan jachtpiloten die op hun beurt de strategische doelen bombardeerden of elimineerden. Ook belangrijke berichten van de Italiaanse partizanen (28e Garibaldi Brigade) bestemd voor het geallieerde algemene hoofdkwartier in Italië werden via de radio-operatoren van P.P.A. doorgegeven. Zijn radio-operatoren sturen belangrijke gegevens dag en nacht door in hun eigen codetaal naar het hoofdkwartier en hielpen op deze manier mee aan de bevrijding van Europa. Popski’s Private Army was founded by Major Vladimir Peanikoff in Cairo in October 1942, becoming operational on 10 December 1942, as an 8th Army Special Forces unit at the suggestion of Lieutenant-Colonel ‘Shan’ Hackett. Its official name was No. I Demolition Squadron PPA” and it was formed specifically to attack Field-Marchal Rommel’s fuel supplies, in support of General Montgomery’s offensive at El Alamein. After the Long Range Desert Group (LRDG) and the Special Air Service (SAS), PPA was the last and smallest of the three main raiding, reconnaissance and intelligence units raised during the North African Campaign. Major Peniakoff had just been awarded a Military Cross for his intelligence reporting and petrol dump raiding while leading the Libyan Arab Force Commando for three months behind the enemy lines, and for an operation while attached to the LRDG. There were further laurels to come. Popski’s nickname referred to a Daily Mirror cartoon character and was given to him by Captain Bill Kennedy Shaw, the LRDG’s Intelligence Officer, because his signalers had problems with “Peniakoff”. The unit’s cover name came from Hackett’s mild exasperation at Popski’s delay in coming up with something suitable: You had better find a name quick or we shall call you Popski’s Private Army”. “I’ll take it!” said Popski. Vladimir Peniakoff was born in 1897 in Belgium of Russian intellectual parents. He was privately educated in Belgium and went up to Cambridge, becoming an ardent Anglophile, influenced by Bertrand Russel. Only four terms later though he signed up as a French gunner during Wolrd War 1 but was invalided out in 1918 after 12 months in hospital. After the war Peniakoff qualified as an engineer in Grenoble. He worked in his father’s chemical factory in Zelzate – Belgium, then in 1924 moved to Egypt to run a sugar refinery. With plenty of leisure time throughout the next 15 years, he climbed in the Italian Alps and learned to fly a light aircraft around the Middle East. He explored the Eastern and Western Deserts, relying on his own resources, learning desert navigation, meeting and talking history with Arab tribesmen. He became a fellow of the Royal Geographical Society, married and had two daughters. When World War II broke out and after his rejection by the Royal Air Force and Royal Navy, a reluctant British Army was persuaded to take on his podgy but persistent middle-aged Belgian. Assigned to mundane garrison duties as an Arabic-speaking junior officer in the Libyan Arab Force, Popski plotted his escape and formed the Libyan Arab Force Commando – a small group of soldiers who operated behind the Axis lines in the Jebel Akhdar area of Cyrenaica. After returning to Cairo in the middle of 1942 only to discover that his LAFC had been disbanded while he was away, Popski was invited to join an LRDG raid in the area he had just left. He learned much about their ways, lost a finger on his left hand to an Italian bullet, and won an MC. It was shortly after this period that PPA was formed: the smallest independent unit of the British Army at 23 All Raanks. The original officers of PPA were Robert Park Yunnie and Jean Caneri. Events proceed rapidly as the Germans and Italian were chased out of North Africa almost before PPA really got going. A joint LRDG-PPA patrol discovered the gap in the mountains that let Montgomery’s armor outflank Rommel’s Mareth Line defenses, and PPA was among the first elements of 8th Army, pushing West, to meet the British 1st Army and American 2nd Corps, pushing East, in Tunesia in early 1943. 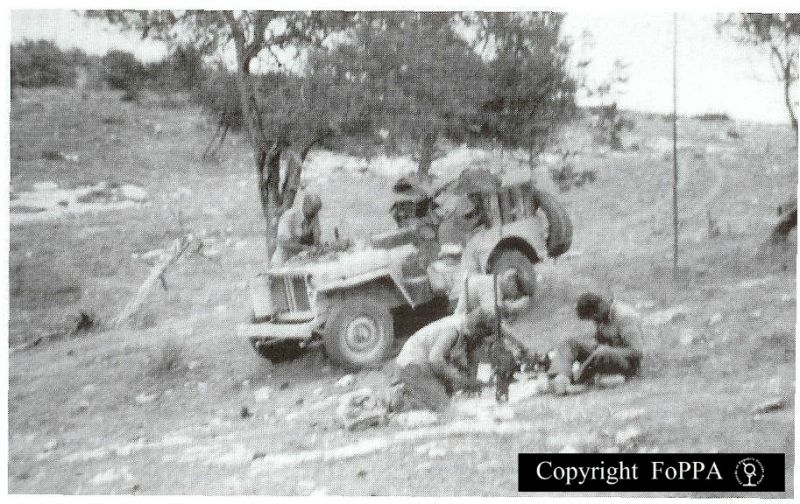 Many PPA raiding and reconnaissance operations were carried out around the time of the Kasserine Pass fighting, including taking the surrender of 600 Italians, alongside British and American Forces. The summer of 1943 was spent in Algeria and Tunisia recruiting and training new volunteers from the LRDG, SAS, Commandos and Royal Armored Corps for the fight in Italy, bringing the unit’s size up to about 35 all ranks, with two fighting patrols and a small HQ. For a short while PPA experimented with using 1st Airborne Division’s gliders to deliver tem and their jeeps behind the Axis lines in Sicily, but their part in that operation was cancelled at the last minute. In September 1943 an advance patrol of PPA sailed to Taranto and headed inland. Popski immediately pulled off a major intelligence scoop by cleverly discovering the weakness of the German 1st Parachute Division opposing 1st Airborne. As a result of this success Popski was allowed to increase the size of PPA to 80 all ranks, but throughout the Italian Campaign about 100 men were actually deployed at any time. PPA was unusual in that all recruits, including officers, reverted to lowest rank on joining – Private or Lieutenant. The unit was run quite informally: there was no saluting and no drill, officers and men messed together and every man was expected to know what to do and get on with it. there was only one punishment for failure of any kind: immediate Return To Unit. It was also efficient, having an unusually small HQ. Three fighting patrols, each of 18 men in six jeeps, and one Tactical HQ patrol of four jeeps were formed and given a great autonomy. Each jeep was armed with a .50in and .30in machine guns, giving the patrols immense firepower for their size. The men trained hard for amphibious, mountain and parachute operations, demolition and counter-demolition, reconnaissance and intelligence gathering. They were deployed in many roles, often clandestine, and for several months even operated as regular front line troops, holding a sector of the Allied front line that was badly depleted after the withdrawal of forces for the D-Day landings in Normandy, nipping around in their jeeps to fool the Germans into believing that they were opposed by much larger units. Several operations used amphibious DUKWs or small landing craft called RCLs (manned by 7 Royal Engineers who inevitable became known as Popski’s Private Navy”) to sail up the Adriatic and get behind the German front line, chaperoned by the Royal Navy’s Coastal Forces. Throughout the bitter winter weather and fighting of 1944 and 1945 PPA undertook their operations ahead of regular forces, in support of British, Canadian, Indian and Polish armored, infantry and Commando units. They located targets for the Allied Air Forces, chased Germans out of rear-areas, saved bridges, captured many prisoners and guns, and accepted the surrender of the entire German garrison at Chioggia. At various times PPA worked alongside other secret units such as the LRDG, SAS, No. I Special Force (SOE), Phantom, ‘A’ Force and OSS. Along the way they adopted many strays, including Russian, Italian and German POW’s, Italian regulars and partisans, both royalist and communist. Popski was awarded the Distinguished Service Order in November 1944, during joint operations (as “Porterforce”) with the 27th Lancers and Italian partisans of the 28th Garibaldi Brigade, to liberate Ravenna, but shortly afterwards lost his hand to a German rifle-grenade. Popski’s Private Army finished the war with a flourish, sailing some of their jeeps on RCLs to St. Mark’s Square in Venice where they drove round and round just for hell of it, the only wheeled vehicles ever to have been there. The unit was disbanded four months later on 14 September 1945, after hunting for Himmler, disarming Italian partisans and discouraging Tito’s partisans from encroaching on Austrian and Italian territory. By this time PPA personnel had gained between them a DSO, a DCM, 6MCs, 10MMs 14 Mentions in Despatches, and HM King George VI had personally requested an account of the unit’s exploits. Popski was promoted to Lieutenant-Colonel and became the British-Russian liaison officer in Vienna before demobilization, naturalization and achieving fame as a British writer and broadcaster. He died in London in 1951 of a brain tumour, having lived long enough to see his book “Private Army become a best-seller. Popski is buried in Wixoe Church cemetery in Suffolk. À la mémoire des opérateurs radio de Popski. Il s’agit d’une activation spéciale de 2 jours lors de l’événement Wings & Wheels à Ursel, en Belgique, les 10 et 11 août 2019, par la section UBA-WLD pour commémorer les radio-opérateurs de l’armée privée de Popski 1942 – 1945. En 2019, à l’occasion du 75e anniversaire de la libération de l’Europe, l’UBA WLD souhaite attirer l’attention sur ces opérateurs de radio plutôt courageux de cette unité assez inhabituelle et irrégulière dirigée par le Belge Vladimir Peniakoff, alias Popski, un petit Belge dans une guerre majeure. Popski’s Private Army, officiellement le n ° 1 Escadron de démolition, P.P.A., était une unité configurée de façon des forces spéciales Britanniques créée au Caire en octobre 1942 par le major Vladimir Peniakoff ou “Popski”. L’armée privée de Popski était l’une des nombreuses unités d’assaut formées dans le désert occidental pendant la Seconde Guerre mondiale. L’escadron a également servi en Italie et en Autriche et a été dissous en septembre 1945. Numéro 1 escadron de démolition P.P.A. a été spécialement formé pour attaquer les réserves de carburant du maréchal Rommel, attaquer les aéroports et organiser des voies d’évacuation pour les prisonniers de guerre afin de soutenir l’offensive du général Montgomery à El Alamein, sur proposition du lieutenant-colonel John Hackett. L’unité est devenue opérationnelle le 10 décembre 1942 en tant qu’unité des forces spéciales de la 8ème armée. Après le Long Range Desert Group (LRDG) et le Special Air Service (SAS), PPA était la dernière et la plus petite des trois plus importantes unités d’attaque, de reconnaissance et de renseignement irrégulières formées pendant la campagne Nord-Africaine. Les opérateurs radio de P.P.A. ont envoyé des messages de loin derrière les lignes ennemies avec leur Wireless Set 19 au quartier général de la 8ème armée britannique. Aussi à proximité de la ligne de front, ils ont transmis des messages aux pilotes de chasse qui, à leur tour, ont bombardée ou éliminée les cibles stratégiques. Des messages importants des partisans italiens (28ème brigade Garibaldi) destinés au quartier général allié en Italie ont également été transmis via les opérateurs radio P.P.A.. Jour et nuit, les opérateurs radio envoyaient des informations importantes dans leur propre langage codé au quartier général et contribuaient ainsi à la libération de l’Europe.